We appreciate your patience in waiting for this upgrade, which made little sense to create until the iPad shared the same version of iOS as the iPhone and iPod touch. Once that happened, creating an iPad version was significantly easier than when the iPad was running iOS 3.2. And yes, although the original iPhone and iPod touch cannot run iOS 4, people who have TidBITS News 1.1 on those devices can continue to use it and aren’t missing out on any major new features. In designing for the iPad, Matt chose to model the TidBITS News app’s interface on what Apple did with the Mail app. So, in landscape mode, a left pane lists article titles and abstracts, and tapping one displays the full article in the right pane. 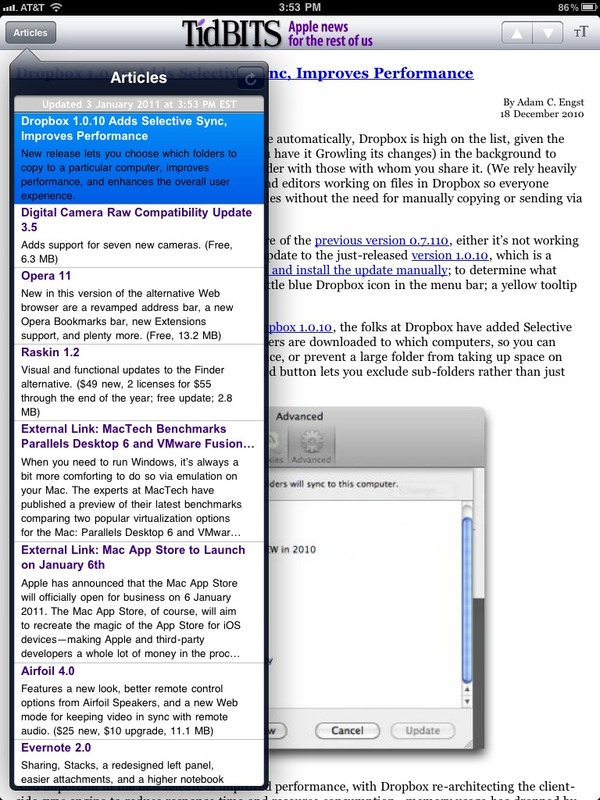 In portrait mode, a popover shows the titles and abstracts and the selected article takes over the entire screen. Otherwise (and on the iPhone and iPod touch), TidBITS News looks and works exactly as it did before, with a few subtle tweaks to make scrolling smoother. You can choose among five font sizes, listen to the audio editions of our articles when available, and tap links to open them in Safari. The app even works offline, so you can load all available articles to help pass the time on the subway. Enjoy! At this time (Jan 5th) it does not look like the app is available in Canada. Can you fix that? That's very odd - the app is set to be available in all stores worldwide, and it has been available in the US store for a few weeks now, so it should have migrated elsewhere. I'll see if I can send a question into the abyss of iTunes Connect support. Hmm, at least the main Web URL shows it appearing in the Canadian store. Checking App store - No iPad app results for "tidbits news"
The app can be found and downloaded through the iTunes application, but it can't be found using the iPad. That's freaky - there must be different indexes or something depending on how you search. I'm confused here. You talk about separate apps for the iPad & iPhone, yet the version I have, 1.3, is a "universal" app in that it runs natively on either one. iTunes says that version 1.3 is the latest one. ??? Yes, sorry if you found my explanation confusing. There's just one app, at version 1.3, and it runs on all iOS 4.2-equipped iOS devices. Previous versions were more confusing, since 1.1 would run on everything (though in emulation mode on the iPad) but 1.2 couldn't be downloaded to the iPad because of the conflict between OS versions supported. Thank you for the clarification, Adam.